I spent the monsoon of 2008 in the serene montane and evergreen forest of West Kameng district of Arunachal Pradesh studying the scorpion diverity in the Eaglenest Wildlife Sanctuary. This is a part of the report that will be submitted to the Arunachal Pradesh Forest Dept. I will post the trip report soon. 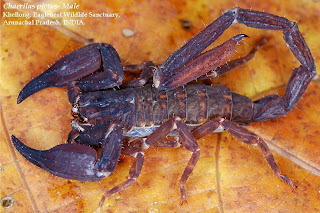 A systematic account of 5 species of scorpions (Arachnida) collected during a survey in Eaglenest Wildlife Sanctuary (EWS) and adjoining area is given. 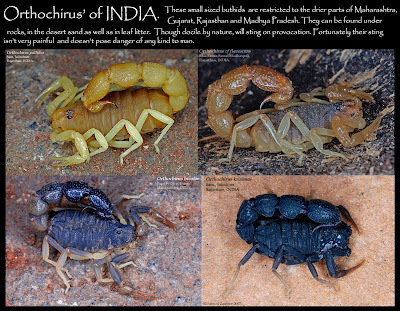 Euscorpiops bhutanensis is a new record for India while Euscorpiops sp. is either Euscorpiops beccaloniae or new taxa. 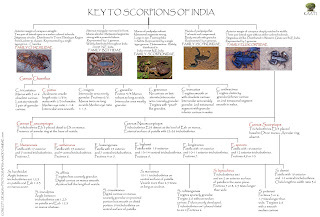 A key to the scorpions of the area has also been provided in the report. The North-East India is one of the Biodiversity Hotspot (Meyrs, 2005). The few remaining tracks of virgin rainforests can be found here in the states of north-east India though these areas are being lost at an alarming rate. Conservation strategies based on the reports of such faunal inventories could prove extremely effective in protecting these areas. Though these forests are exceedingly diverse, our knowledge about them is unfortunately very poor and in bits and pieces. Extensive surveys are needed to get a preliminary idea of the faunal diversity of these areas. The areas in and around EWS, West Kameng district, Arunachal Pradesh were surveyed for scorpions in the months of May and June 2008. The areas north of Rupa (not a part of EWS) were surveyed by a team of zoologist from Zoological Survey of India in early 1990’s. Their survey resulted in the discovery of Euscorpiops kamengensis from Sera village close to Bomdilla (Bastawade, 2005). To the best of our knowledge, this is the first ever survey of its kind being conducted in this area. Areas adjoining Ramalingam, Lama Camp, Sessni, Khellong and Doimara were extensively surveyed. The searching in most of these places was restricted to the areas along the road. Though at places were access to the forest was possible those areas were also surveyed. Random search method was used during the survey and scorpions were searched for under rocks, in crevices and under fallen tree trunks. A UV torch was used to locate scorpions at night as scorpion’s florescence in UV increases the chances of spotting a scorpion. Once spotted the scorpion was picked up gently using forceps (6 inches long) and were placed safely in a bottle. Similar looking specimens were photographed to check for trichobothrial patterns and number and the only the ones which showed significant variations were collected for further studying. The others were immediately released at the location of capture. Medium sized scorpion. Entire body weakly granular. Carapace broad and anterior margin deeply notched in the middle. Chelicera smooth on basal surface. Pedipalps extremely thin, slender, elongated on femur, patella and manus (Plate 1) in males while normal in females. Pectines weakly developed 7 or 8 in number. Mesosomal tergites weakly granular and last sternite with two pair weak carinae. Metasoma weak with elongated telson with an annular ring. Body colour entirely while telson is red. Legs black in colour but tarsomere II brown. Exterior surface of patella with 17 trichobothries while ventral surface with 7 or 8 trichobothries. Manus four times as long as wide in males while only two and half times as long as wide in females. Distribution: Numerous specimens were observed under rocks and in crevices near Lama Camp (2350 m) in EWS. Remark: The specimen was described on the basis of two male specimens collected from Gomchu, Eastern Bhutan in 1966. This species has been reported for the first time from India and a detailed description of a female specimen has been given. Medium sized scorpion but males bigger than females. Carapace and tergites sparsely granular. Metasoma weak, carinated and granular. Telson elongated with annular ring. Mesosomal sternites smooth. Last sternite well developed with smooth carinae. Pectines weak 5 or 6 in number. Body and pedipalps black in colour. Chelicera, mesosomal tergites and telson brownish in colour. Sternites yellowish. Legs black in colour with brown tips. Exterior surface of patella with 18 trichobothries while ventral surface with 8 or 9 trichobothries. Distribution: A single specimen was collected from Khellong (750 m) under a rock. Also known from other parts of Arunachal Pradesh and Assam. Large sized scorpion. The mesosoma is granulated, with one median carina, and the seventh segment ventrally bears four inconspicuous carinae. The entire carapace is granulated, without carinae. Pectinal teeth number 8, 9 or 10. The metasoma is smooth, carinated with only sparse granules. The dorsolateral carinae of the third and fourth segments posteriorly terminate in a pronounced tooth. The telson is elongate, with minute granules, exhibiting an annular ring at the vesicle/aculeus juncture. Body colour entirely black with red telson. Distribution: Numerous specimens resembling above mentioned characters were obtained from Khellong (750 m) and Doimara (250 m). Remarks: The specimens closely resemble E. beccaloniae but differ in some morphological aspects. E. beccaloniae was described from a single male specimen collected from Myanmar in 1930. Medium sized scorpions. Entire body surface coarsely granular. Carapace elevated in the middle and more granular. Chelicera smooth with elongated fingers. Pectines with exceptionally long and tubular teeth 7 or 8 in number. Mesosoma densely granular with the sternite provided with two pairs of granular carinae. Metasoma granular with prominent keels. Telsons powerful as wide as segment V. Annular ring absent. Body colour entirely black or brown. Legs black with red tarsi. Pedipalps also black in colour. Telson reddish brown. Pectines 2.5 times as long as wide. Trichobothries em1 and em2 of patella in the same plane. Trichobothries Esb3 not placed between Dt and Est. Distribution: Two individuals were found one at Ramalingam (1250 m) and other at Sessni (1250 m). It is a widespread Euscorpid distributed all over Arunachal Pradesh. Male slender with extremely long metasoma and a peculiar telson. Male almost double the size of female. Female with short metasoma. Body surface weakly granular. Carinae on carapace and mesosoma not prominent. Metasoma carinated, all carinae crenulate. Chelicera smooth. Pedipalps short and robust. Manus with seven carinae. Legs smooth except on femur. Pectines weakly developed 5 in number. Body colour differs in males and females. Males reddish brown basic colour with dark violet variegations. Legs yellowish brown in colour. Metasoma brown with dark violet variegations. Females yellowish with brown variegations. Aculeus to vesicle length ratio 1/8 in males and 1/3 in females. Manus with seven carinae. Median eye located anteriorly in the ratio 1:1.8. Distribution: We found two male and two female specimens in Khellong (750 m) under pile of rocks. This is a rare species and hardly anything is known about them. It has been reported from Lohit district of Arunachal Pradesh. Remarks: This find sheds new light on the probable range of this scorpion and may suggest that it is widely distributed. I am grateful to the following people in helping me with my stay at Eaglenest and during the preparation of this manuscript, Ramana Athreya for being a friend, philosopher, guide and providing adequate monetary support to carry out the survey. Chintan Sheth for all the discussions we have had over taxonomy and for being a very resourceful companion both on and off the field. Kesang, Sange Khandu and Dawa Tsering Tamang for helping me find scorpions and being more than porters to us. Mr. Indi Glow for making my stay comfortable in Eaglenest. Mr. G.N. Sinha, Director of SFRI Itanagar, for granting necessary permissions to loan and study the specimens. I thank Dr. D. B Bastawade for his useful comments in improving the manuscript, without his constant support and encouragement this MS would not have materialised. Thanks to all who might have felt that they have contributed in the preparation of this note. Bastawade, D. B. 2006. Fauna of Arunachal Pradesh, State Fauna Series-13 Part-2:449-465, Zoological Survey of India. Fet, V. and M. E. Soleglad. 2005. Contributions to scorpion systematics. I. On recentchanges in high-level taxonomy. Euscorpius, 31: 1–13. Kovařík, F. 2005. Three new species of the genera Euscorpiops Vachon, 1980 andScorpiops Peters, 1861 from Asia (Scorpiones: Euscorpiidae, Scorpiopinae). Euscorpius,27: 1–10. Tikader,B.K., D.B. Bastawade.1983 The Fauna of India. 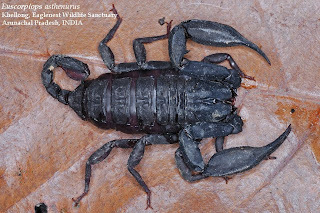 Scorpions, Scorpionida: Arachnida,Volume III, Zoological Survey of India. Polis,G.A., (editor). 1990 The Biology of Scorpions. Standford University Press. Fet,V , Sissom,W.D, Lowe, Graeme and Braunwalder, Matt E. 2000 Cataloge of theScorpions of the World (1758-1998), The New York Entomological Society. Rein,J.O. 2008 Scorpion Files. Norwegian University of Science and Technology, online at;http://www.ub.ntnu.no/scorpion-files. Soleglad, M. E. & W. D. Sissom, W. D. 2001. 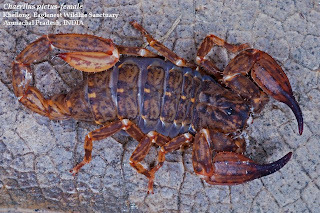 Phylogeny of the family Euscorpiidae Laurie,1896 (Scorpiones): a major revision. Pp. 25–111 in: Fet, V. & P. A. Selden (eds.). Scorpions 2001. In Memoriam Gary A. Polis. Burnham Beeches, Bucks: British Arachnological Society. Qi, J.-X., M.-S. Zhu & W. R. Lourenço. 2005. Eight new species of the genera ScorpiopsPeters, Euscorpiops Vachon, and Chaerilus Simon (Scorpiones: Euscorpiidae, Chaerilidae)from Tibet and Yunnan, China. Euscorpius, 32: 1–40. Just back from a brief visit to Bhimashanker. Had gone there specifically for finding two scorp species that had eluded me for quite some time. Though I had seen both the species once or twice before, I never managed to photograph them. The genus Neoscorpiops is endemic to India and is known only from a few restricted localites. The genus is represented by only three species viz. N. satarensis from Mahabaleshwar and Satara in Maharashtra, N. deccanensis known only from the type locality Sihnagad forest in Pune distrct in Maharashtra and N. taenicauda Matheran and Bhimashanker in Maharashtra. 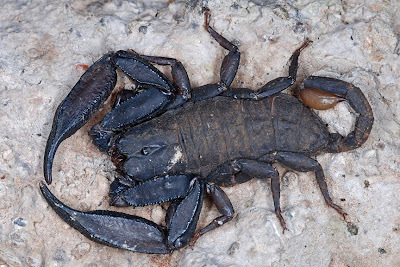 These are black coloured, small to medium sized scorps which generally are found in stone cervices or under rocks. They are scorps of moderately high elevations and are conspicuously absent at low elevations. The species can be distinguished from each other by the number of ventral trichobothries on the patella. A publication by Dr. Bastawade in JBNHS is wroth reading for anyone who is interested in working on these scorps. In case anyone wants details let me know i can forward a copy of the MS.
Orthochirus Karsch, 1892 consists of small-sized buthids whose size does not exceed 60 mm (Kovařík, 2004), but however Indian forms do not exceed 40 mm. The carapace in lateral view is distinctly inclined downwards from the median eyes towards the anterior margin. Species in this genus exhibit beta-configuration in arrangement of trichobothries on dorsal surface of femur of pedipalp. Tibial spurs are present on the third and fourth legs. The I and II metasomal segments without carinae. IV and V metasomal segments ventrally punctuate. Telson elongated, aculeus as long as or longer than vesicle (Tikader and Bastawade, 1983; Kovařík, 2004). Currently 29 species have been included in the genus Orthochirus globally (Kovařík, 2004; Rein, 2008), out of which 5 have been reported from India. Of this the status of O. scrobiculosis (Grube, 1873) is considered doubtful (Kovařík, 2004). Apart from this, based on the presence of d2 on the dorsal surface of O. krishnai, Kovařík (2004) considered this species as a nomen dubium. 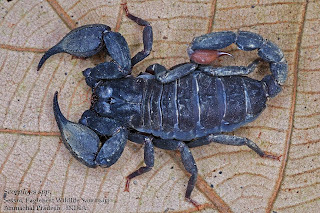 Scorpion Files- http://www.ub.ntnu.no/scorpionfiles/ One of the most comphrehensive websites for scorpions. Contains excellent photographs of scorps, useful links, there is blog that has been created which is updated regularly. 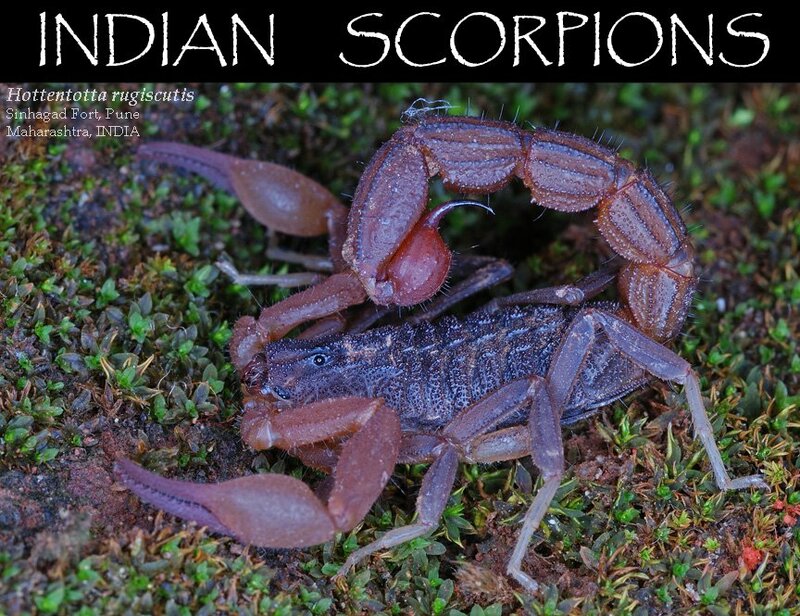 František Kovařík- http://kovarex.com/scorpio/ One of the few scorpion taxonomists who have extensively worked on Indian scorpions. You can download most of his works from this website. 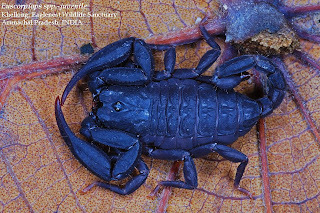 The Scorpion Fauna- http://pagesperso-orange.fr/eycb/scorpions/ Excellent scorpion information and pictures by Eric Ythier. One of the best pages on the net for quality ensured scorpion information. I hope you will find "scorps" interesting and beautiful (if u dont ... its still acceptable) as I do. Knowledge is like water... never say "No" to anyone who is thirsty!